Yes, that’s right, fat free! I’ve made Ina Garten’s black and white angel food cake before and just love the idea of a cake that doesn’t incorporate any fat – no butter, no oil, no egg yolks. In fact you shouldn’t even grease the baking tin. 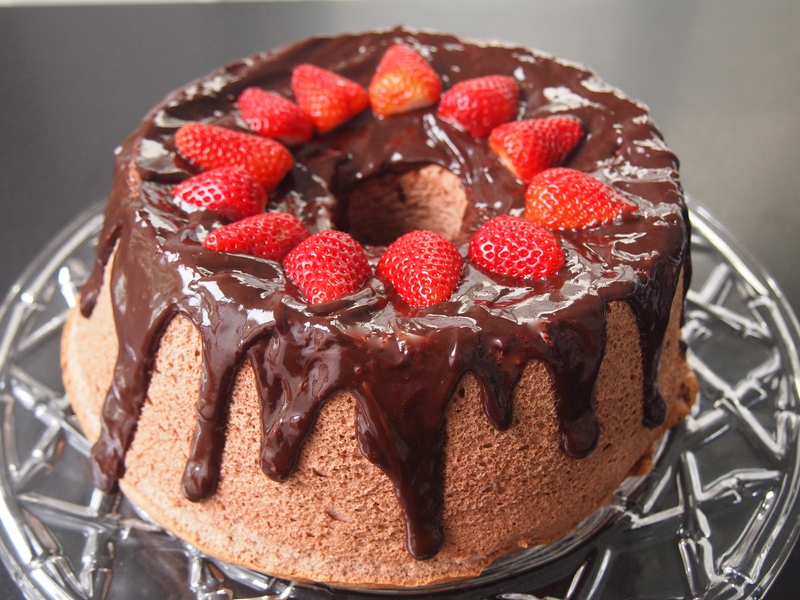 In this version even the chocolate is fat free as it’s made using cocoa powder. Of course if you wish to ice your cake with some ganache as I’ve done then a small amount of fat is going to creep into the equation, but to be quite honest this cake is so incredibly moist it doesn’t need it. This is a great recipe if you’re looking for ways to use up a lot of leftover egg whites, and I mean a lot – 14 of them! I always have a lot of leftover egg whites in my freezer from making ice cream and I hate throwing them away and there’s only so much pavlova and egg white omelettes we can eat. So I was thrilled to find angel food cakes which clear up my freezer of all the little bags of egg whites in one hit. The other bonus if you’re an egg white hoarder is that stale egg whites whip up much better and retain more air than fresh ones. Pre-heat oven to 180C (not fan forced) and place rack in centre of oven. Have ready a 10-inch two piece angel food cake (tube) pan. Don’t grease it as it will stop the cake from rising. Bring the egg whites to room temperature. 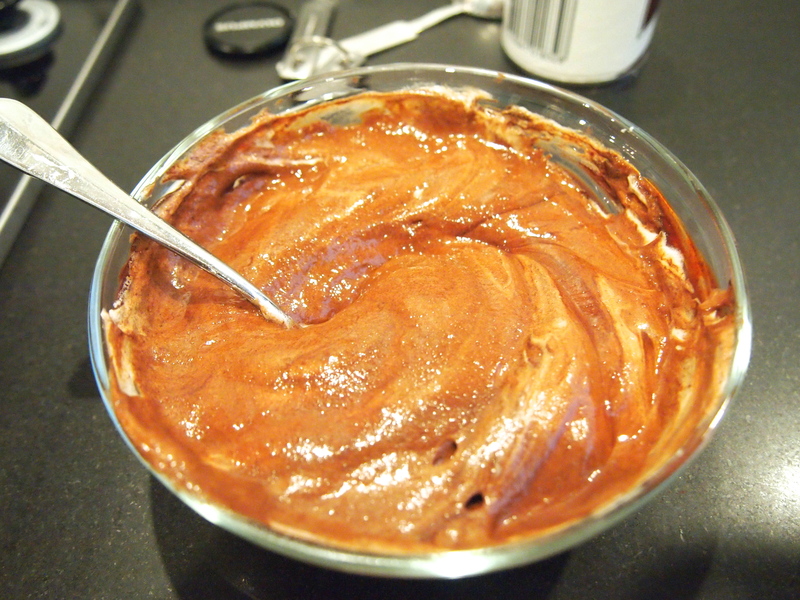 In a small measuring cup or bowl combine the cocoa powder and boiling water and stir until smooth. Stir or whisk in the vanilla extract. Set aside. 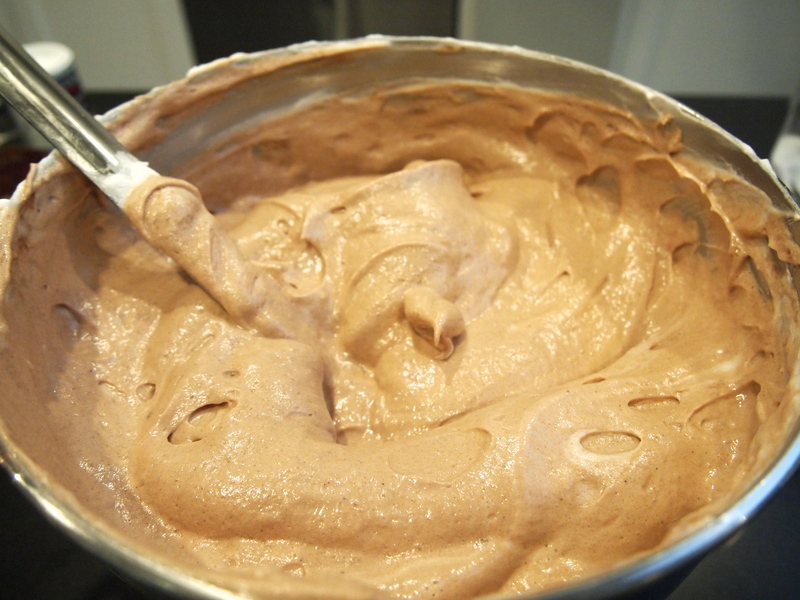 In another bowl whisk together ¾ cup of the sugar, the sifted cake flour, and the salt. Set aside. 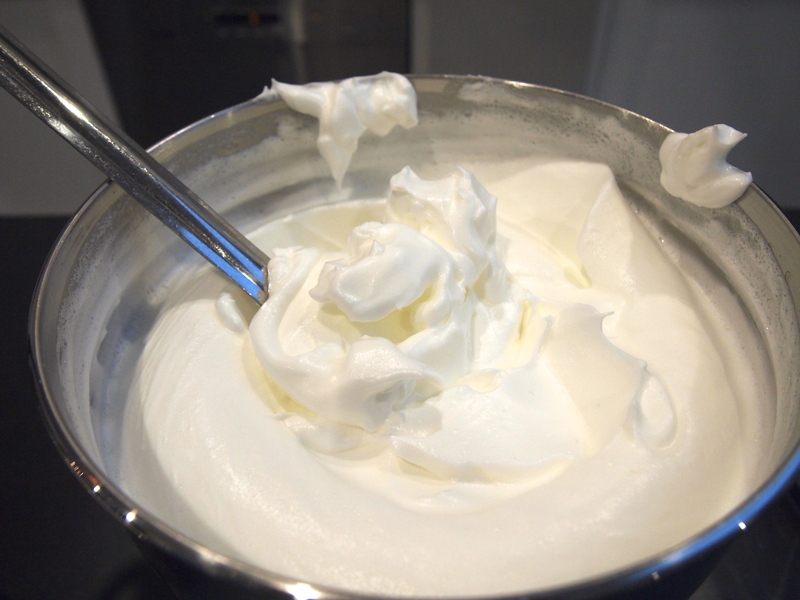 Using a stand mixer with the whisk attachment beat the egg whites until foamy. Add the cream of tartar and continue to beat until soft peaks form. Gradually beat in the remaining 1 cup sugar until stiff peaks form. Pour the batter into the pan (it will be almost full) and run a metal spatula or knife through the batter to get rid of any air pockets. Smooth the top and bake in the oven for about 45-50 minutes. It is done when a wooden skewer inserted in the centre of the cake comes out clean and the cake springs back when gently pressed. The top of the cake will have cracks. Immediately upon removing from the oven invert the pan. Suspend the pan by placing the inner tube on the top of a soda or wine bottle or onto a wire cooling rack. 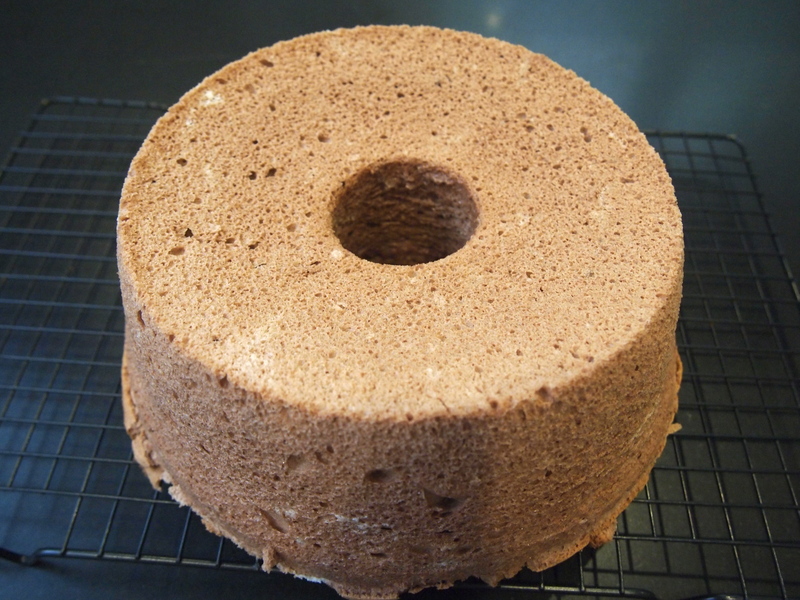 Allow the cake to cool for about 1½ hours. When completely cool, run a metal spatula or knife around the sides of the pan to loosen the cake and then remove the cake from the pan. Next, run a metal spatula or knife along the bottom and center core of the pan and remove. Place onto a serving plate. 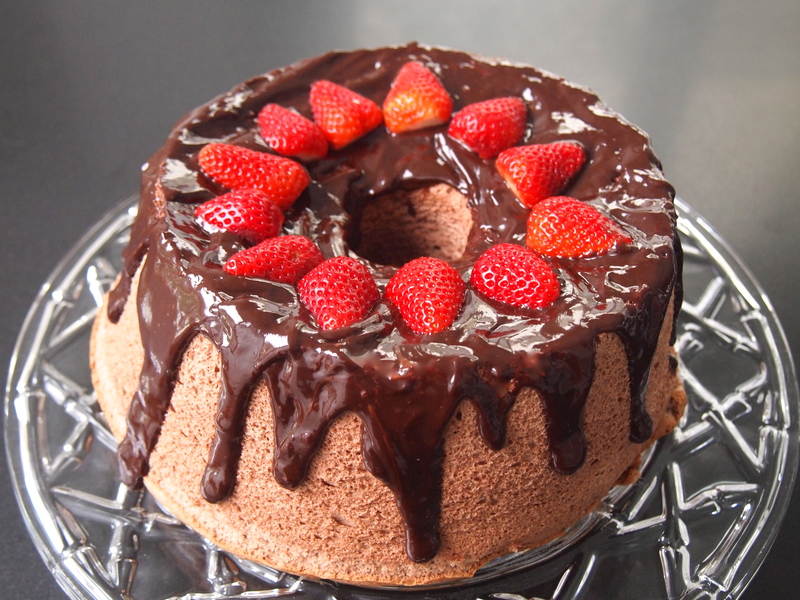 Serve plain with some fruit or ice with chocolate ganache.